The twisted family tree of the American bands U Totem, Thinking Plague, 5uu's and Motor Totemist Guild is perhaps representative of the challenging, ever-changing music that these four groups offer. In the business since the mid eighties, 5uu's have a history of Zappa-influenced eclecticism coupled with a high degree of musicality. Trimmed down to a three-piece consisting of Sanjay Kumar on keyboards, Dave Kerman on drums, guitars and keyboards, and Bob Drake on vocals, bass, guitars, and violins, they are assisted on various tracks by U Totem and Thinking Plague alums James Grigsby and Susanne Lewis, as well as new accomplices Thomas DiMuzio and Michelle Bos. Hunger's Teeth is eleven tracks with lengths from one and a half to six and a half minutes. The styles include discordant guitar/keyboard wailing over a rock-ish beat on "Opportunity Bangs," mandolin picking on the intro to "Geronimo," contrapunctual piano on "Truth, Justice and the American Way," rolling bass and keys on "Bachelor Needle," trance-inducing electronics on "Mangate," lilting vocal harmonies on "Roan," and even a barbershop quartet on "Shears." But to describe any track in one or two words does no justice. Almost every piece encompasses multiple themes, movements and styles. Predominant throughout is the vocal presence (with Bob Drake sounding surprisingly close to Jon Anderson of Yes), the compositional complexity, and a sense of uncertainty. Even after hearing two-thirds of a given track, you're never sure what is going to happen next. Combining the influences of Henry Cow, and Cow-related bands such as the Work and Art Bears, with Zappa's sense of musicality and humor, they have moved forward and created an album that defies categorization. My only gripe (and it is a minor one) is that Dave Kerman's drumming is very basic at times, which seems inconsistent with the rest of the music, as those compositions are quite complex. On several tracks, such as "Truth, Justice and the American Way," as well as "Traveller Waits for No One," he resorts to snare-bass riffing. While the guitar, keyboard, vocal and bass lines are more than enough to fill one's ears with their intertwined, multi-track complexities, a busy drummer would have put the finishing touch on these tracks. However, throughout most of the album Kerman's playing is top-notch. 5uu's is an experimental band not only in the musical sense, but sonically as well. Their use of electronics, computer-generated sounds, and the dreaded sample shows that these techniques are not a musician's cop-out. My hat is off to this band, they have lived up to their potential and beyond. So far, this is the best 1994 release I've heard. Highest recommendation. Here's a really unexpected surprise. The 5uu's used to be the epitome of overlyrical RIO mediocrity, a quirky semi-political group influenced by the Henry Cow / Art Bears sphere. While their albums weren't bad, neither were they very interesting until they combined with the Motor Totemist Guild as U Totem. Still, even that band couldn't have hinted at the 5uu's newest release in years. It's about a 75-25 mix of RIO to progressive rock, and a very original one at that. As it really can't be described as a whole, other than as an amalgam of many styles, all I can do is pull out some pieces — most will notice the high tenor vocalizing that sounds uncannily like Jon Anderson (yet in no way approaching his nauseating fluffiness); the rock parts have a rough similarity to some of Samla / Zamla's music, Miriodor, or of course the Art Bears (staggered and almost weird just to be weird); there's an unusual collage piece similar to Steve Moore's work; and even a barbershop quartet that seems fairly out of place; and the lyrics can be quite cutting and poignant. While the overall effect isn't as smooth as many would like, it certainly is one of the most unique and startling albums in a long time — original, vibrant, and cutting edge. This comes highly recommended to RIO fanatics and those wanting something a bit different from the usual fare. Ever wonder what some of the classic progressive bands would sound like today had they maintained their edge and not grown lazy and comfortable and become caricatures of themselves? Enter the 5uu's. Take the experimental rock spirit, add some influences in varying combinations from Henry Cow, Frank Zappa, Yes, The Beatles, and Gentle Giant, mix it all together and send it into overdrive, and you might have some idea of where these guys are going. Their music is a constantly changing stream of ideas, very complex, with irregular time sigs and liberal use of dissonance within their melodic framework — yet it's all fairly accessible too, tied together by Bob Drake's Jon Anderson-like vocals. Even those already familiar with the band on their early releases Bel Marduk & Tiamat and Elements may be in for a surprise here as well, as this is a major step forward for them. Presently a trio of Sanjay Kumar (keys), David Kerman (drums, guitar, keys), and Bob Drake (vocals, bass, guitars, violin), Thomas DiMuzio is also credited with "electronic and computer generated sounds" and is responsible for some of the more experimental moments on the disc. Kumar and Kerman were both members of previous 5uu's incarnations, as well as U-Totem, and Drake was a member of Thinking Plague and Hail. Guesting on selected tracks are Suzanne Lewis (also of TP and Hail), James Grigsby (of U-Totem), and Michelle Bos. If you've ever wanted one disc that you could listen to over and over, while never growing bored with it, and discover something new each time, this is it! From the first notes of "Well, Not Chickenshit," through the experimental voice treatments on "Mangate," the mysterious cadence in "Geronimo," an out-of-place barber shop quartet on "The Shears," the Zappa-esque opening riff of "Bachelor Needle," Suzanne's vocal on "Equus," right out to the twisted and abrupt ending of "Traveler Waits for No One," this is an album that will demand repeated listenings. 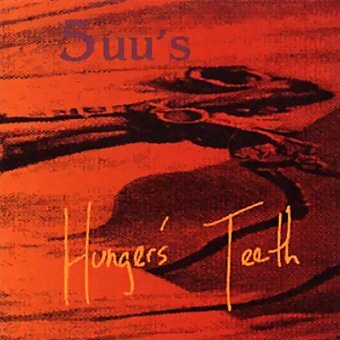 Hunger's Teeth gets my highest recommendation, and will definitely be among my top ten for 1994.